When you take a simple sweatshirt and add a fun detail such as a tied bow at the neckline, you turn that simple garment into a sensational outfit that can be worn for many occasions with many other types of clothing. 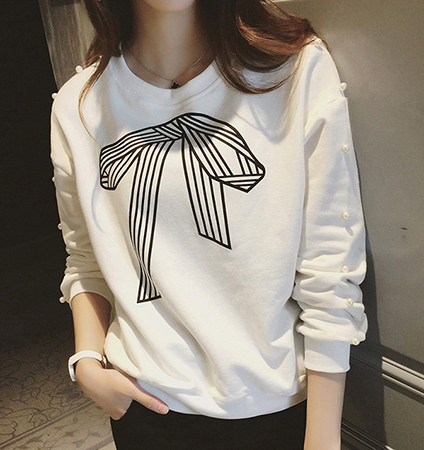 This fun sweatshirt, made of cotton knit, has a whimsical bow tied ribbon at the neckline in wide stripes, with a casual drape. A rounded ribbed neckline, sleeve edge and matching hemline keeps the style consistent. Large pearl buttons are sewn into the sleeves for a three dimensional effect. This one is a keeper! Small size; bust 110 to 148 cm, sleeve length 45.5 cm, overall length 55 cm.